We assist organizations with documentation or marketing material (e.g. brochures, manuals, website content, PowerPoint presentations, product labeling, etc.) that is written in the Spanish language and requires accurate translation into English. We assist businesses in finding the best available Spanish to English language translation resources – an experienced Spanish language translator (native-speaking Spanish if appropriate or required). In our experience, a Spanish language native-speaker may not necessarily be the right translator for the job. (See: Common myths and misconceptions about translation.) Though a native-speaker may be preferable for certain translation assignments, having Spanish as a native language may not 'translate into' Spanish language expertise (pun intended). An experienced linguist with strong Spanish and English language translation credentials, in-depth experience and professional credentials, regardless of native language, may often prove to be a better choice. 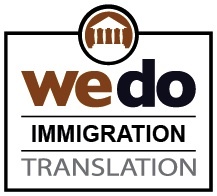 Identifying and securing the services of the appropriate Spanish language resources is what we do! (Refer to our Spanish translation assignment process for information on our Spanish translation project management process). In a nutshell, we use professional translators who have a solid mastery of the Spanish language (grammar, spelling, cultural nuances) and a solid understanding of the subject matter. If we cannot secure the appropriate resources, we will do our best to refer you to Spanish translation sources of information that we have confidence in. Translate 8 Spanish Pro is the ultimate in power and flexibility for Spanish translation software. 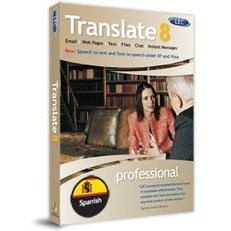 Translate 8 Spanish Pro translates Spanish documents, websites, blogs, emails, chat, and instant messages. Plus you get these added PRO features: translate multiple documents with one click, access industry specific dictionaries that translate specialized terminology, and create new dictionaries with your own terminology. You can also translate the widest range of file formats in the industry, including PDF, HTML, XML, TXT, PDF, DOC and RTF. 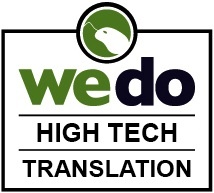 The PRO version of our translation software allows you to translate quickly and effortlessly in business applications you use every day: Word, Excel, PowerPoint, Outlook, Internet Explorer and Firefox. Integrated onscreen menus and toolbars make translation easy. Your Complete Spanish learning suite contains every Spanish language-learning application you'll need to help you improve your Spanish language skills! 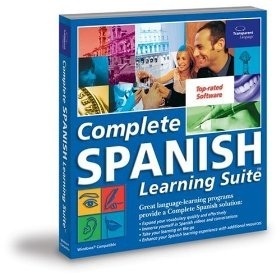 Ideal for school, business, travel, or simple personal growth, the Complete Spanish Learning Suite offers you the most comprehensive way to learn Spanish. From top-rated software to an audio course, Complete Spanish gives you access to a broad variety of fun, effective Spanish learning solutions that will develop all your Spanish skills. 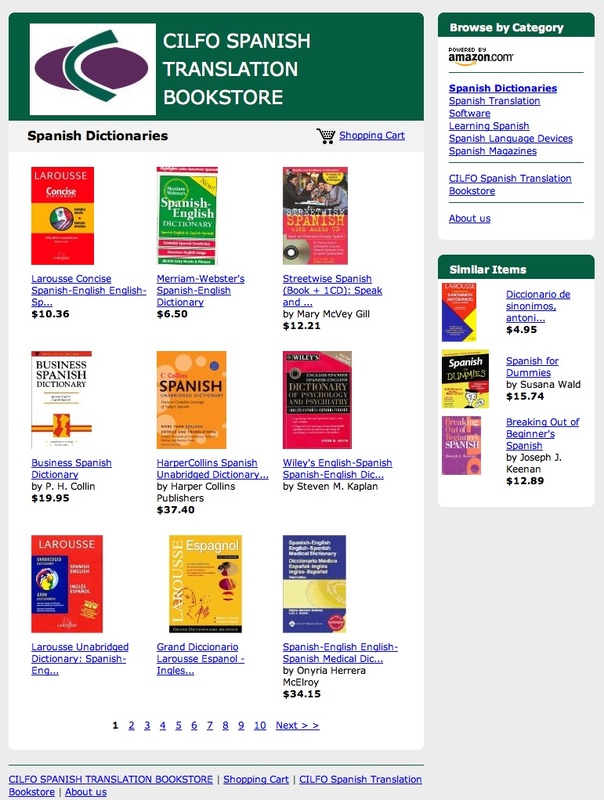 FreeTranslationClassifieds.com website for Spanish Translation resources. • CILFOtranslations.com website for Spanish Proverb English↔Spanish translations. Everything the web has to offer in terms of Spanish books, Spanish reference material, Spanish translation software and hardware that is of particular interest to translators working with Spanish, as well as the Spanish translation and linguistics community can be found in the CILFOtranslations.com Spanish Translation Bookstore.